Saving for tax payments isn’t a business owner’s favorite thing to do and often cause a little bit of anxiety for many trying to manage books on their own. So, let’s tackle how and when to tackle the beast of burden with a tax savings account. Are the estimated taxes dates stressful days for you throughout the year, or do you approach those dates more as a “I transfer the money and forget about it” type of day and just move on with your day-to-day business? If these dates tend to stress you out, I’ll guess it’s because you don’t pay attention to the dates; letting them creep up and surprise you. The key to reducing stress about a situation is to educate yourself about it and plan for it. Quarter 4 is due January 15th This is the quarter you want make sure all of the previous year’s taxes are paid to the best guess. More on this later. Last September, I was talking with a client; (we’ll call her Emma), about making sure she paid her estimated taxes on time. Emma got all stressed out saying “I owe that much?!? I don’t know where I’m going to come up with that much money by the 15th.” She went on to explain, “My sales were down last month so my cash flow is low. What am I going to do?” This situation is a lot more common than you may think. Carefree Bookkeeping counseled Emma to help put her on the right path, and a future of less financial stress. Emma was ready to make a change on how she set up her cash flow so those tax dates are just another day and she doesn’t even think about it. Emma has a serviced-based business where she has around 20 invoices a month she collects money on. As Emma makes a deposit, she moves a % of the deposit into a TAX SAVINGS ACCOUNT. This way she can pay her taxes straight from the savings account and pay her other bills from the remaining monies deposited. This is the same idea or format used when you were an employee and your paycheck had the taxes pulled out and you got to spend the net income from your pay. You want this tax savings in a separate account; even better, another bank, so you do not have easy access to use this money to pay other bills. This is why employers with w-2 employees keep individual tax payments from the payroll check.. to keep employees from spending that money. As business owners, you have to budget for those estimated taxes yourself. If this is hard for you to do on your own then you need an accountability partner. Your bookkeeper or accountant would be the best accountability partner, but at the very least, you should have someone you trust as a second signer on your account. You should also make sure you have no online viewing of the account. Instead, set up the account so both you and your accountability person need to walk into the bank and both sign for the cashiers checks to use the money. Here’s how we set up Emma for success. We looked at the tax return from the previous year, looked at the amount of taxes due with the estimated taxes payments made for that year, and then divided it into the income amount for that year. This gave us a percentage of the deposit amount Emma needed to save from each deposit. TIP: Another way you could tackle the goal would be to just pick a reasonable percentage, like 15%, that you automatically move from each deposit over to your Tax Savings Account. At first Emma didn’t think that she could put 15% away in saving and still pay the bills. I told her it was okay and we could start at a smaller amount then work our way up to 15%. Part of the conversation was a circle-around back to her financial reports that showed she actually did pay 15% in taxes last year without saving it by adjusting who she paid in the month the taxes were due. But, that method causes more anxiety and stress, so spreading it out over the year through digestible saving amounts will reduce that stress. Emma starting by saving 5% every deposit and increased the percentage every quarter until she got to the 15%. The estimated tax days became less and less stressful as she already had the money in the savings account. I told Emma if she deposited $1,000 and moved $50 dollars to her savings she wouldn’t even miss the allocated money. And, she didn’t miss it at all. When the next quarter came around it was even easier for her to save 10%. To make this plan work you have to move the money the same day so the whole amount of the deposit doesn’t show in your checking account. Also, Emma’s case, she needed to hide the savings account when logging into the bank’s website (she had both accounts at the same financial institution), so she didn’t see how much money was sitting there when trying to pay other bills. TIP: When both accounts are at the same bank set up the Tax Savings Account as a one-way savings account with the only out going funds available to the IRS and State. Remember, this is NOT YOUR MONEY it’s the governments money. After two years of working to save for taxes at the time of the deposits, Emma called Carefree Bookkeeping with another concern. She told me she had more money in the account then what she needed for taxes. What should she do? I advised Emma to do the math and adjust the percentage she is putting into the savings account from the deposits. Then we went over her financials and discussed her wishes for this money. Options discussed included identifying other debt that could be paid down, using the extra savings for strategies to help with business growth, or find something fun to do with the money in the business if neither of the other two options were viable or reasonable. This overage would be the equivalent to a tax refund. After going over each of these options with Emma, I had to pull the phone from my ear because she was screaming for joy. Emma had no debt, so she was going to find something fun to do with this money. 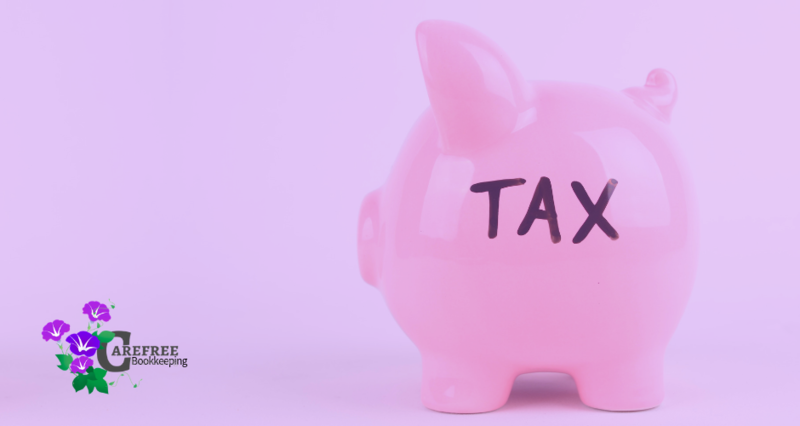 For companies who have large deposit amounts from account payable resources, the estimated percentage of savings to the Tax Savings Account should be moved on a daily or weekly basis rather than monthly or from each individual deposit. This same method can also be applied for sales tax or provider tax payments. The IRS set up the payment due dates. April 15th is the balancing date for the last year’s taxes, but the IRS is set up to have two tax payments due on April 15th. The balancing out and the tax return filing for the previous year, or as we all know it, tax date. The first payment for the current year’s estimated tax is also due on April 15th. If budgeted properly you should be able to have your January 15th payment adjusted to just pay the final amount of the previous year’s taxes so when the April 15th due date rolls up you just need to focus on the 1st quarter estimated taxes of the new year. You want your tax return to show you owe zero and your refund is zero or as close as it can be on this date. It’s better for you to have the extra tax money set aside in your savings account then to have the government play with your money while you wait for a refund from them. Just think if you filed your taxes on March 1st and discover you have extra money saved from last year. You could be playing with that extra savings on March 1st. NO waiting. For Additional Questions About Tax Due Dates, Budgeting and the Best Way to Set Up a Tax Savings Account, Contact Carefree Bookkeeping at 612.986.1192 to Schedule Your FREE Initial Consultation Today.